- Bringing the future to life: first virtual drive in the BMW Vision iNEXT. - The personal companion and new digital services from BMW. - The BMW Intelligent Personal Assistant – today and in the future. - Digital services for electric-vehicle charging. 1. 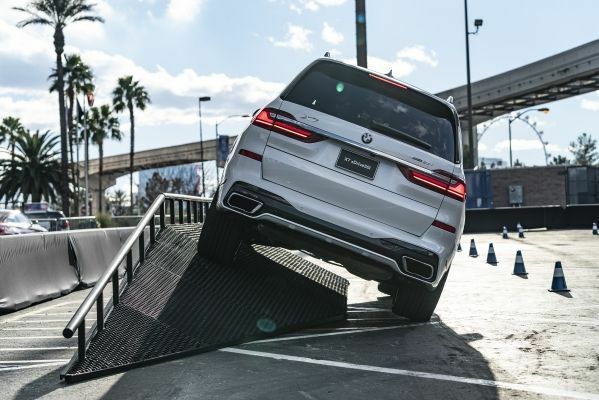 BMW Group at the 2019 Consumer Electronics Show (CES) in Las Vegas. At the 2019 Consumer Electronics Show (CES) in Las Vegas from January 8 – 11, 2019, the BMW Group will present its vision of intelligent connectivity to the public, highlighting the potential for future individual mobility. The focal point of the company’s CES showcase will be the BMW Vision iNEXT, which looks ahead to the future of driving pleasure, and the BMW Intelligent Personal Assistant, which, as an on-board expert and the soul of the BMW, constitutes the central element for interaction between the driver, their vehicle, and their digital world. The BMW Vision iNEXT forms the optical highlight of the exhibition stand, which also showcases the interior design principle “My Favorite Space” with harmonious, natural surfaces and technology that is kept discreetly out of sight. 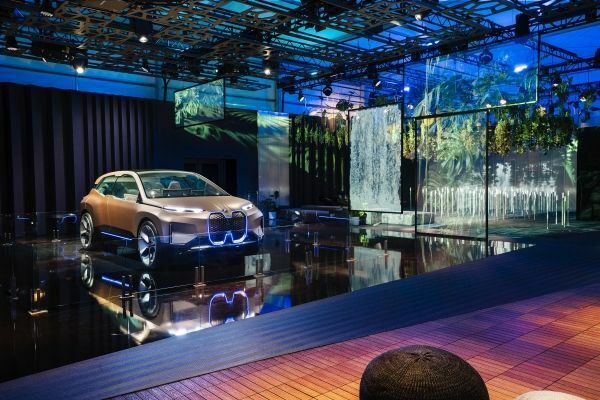 A sophisticated mixed-reality installation also provides a virtual impression of the future driving experience promised by the BMW Vision iNEXT. The BMW Vision iNEXT combines ground-breaking design with the future areas of activity defined in the company’s Strategy NUMBER ONE > NEXT – Autonomous Driving, Connectivity, Electrification, and Services (D+ACES) – and answers the question: “What will cars look like when they no longer have to be driven by a person, but still can be?” The interior can be a place for relaxation, interaction, entertainment, or concentration, as preferred. It is more like a comfortable and fashionably furnished “living space” on wheels – a new “Favorite Space”. A new design principle, referred to as “Shy Tech”, plays an especially important part in this. To preserve the high-end, yet cozy character of the rear compartment, and place its occupants center-stage, the intelligent technology behind the operating controls is integrated out of sight. It only becomes visible and operable when required by the driver or passengers. 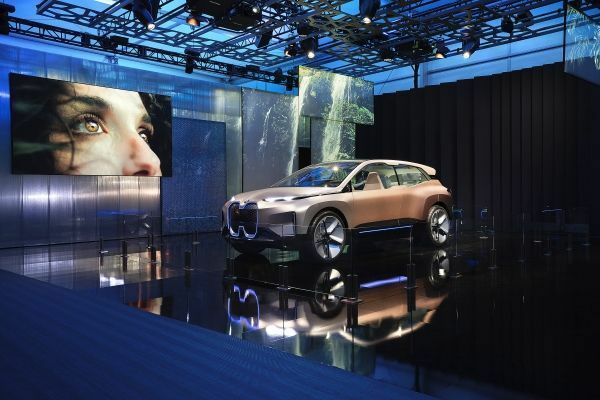 Two additional exhibits clearly demonstrate the “Shy Tech” principle and technology installed in the BMW Vision iNEXT to CES visitors. The BMW Vision iNEXT is also part of the customer’s digital world and seamlessly integrated into the network that connects smart devices, smart home, and digital services. In the exhibition center’s outdoor areas, BMW and BMW Motorrad will be offering two completely different, but uniquely fascinating experiences. To showcase the BMW Group's high level of expertise in automated driving, BMW Motorrad will present a spectacular test and research vehicle at the CES 2019. The self-riding BMW R 1200 GS is able to start, accelerate, perform cornering maneuvers, slow down, and come to a stop – all by itself. Development of this test vehicle will provide valuable insights into riding dynamics, which can then be used to help the rider recognize dangerous situations and master difficult driving maneuvers. In this way, the self-riding motorcycle, with its comprehensive understanding of ideal lines and perfect cornering, correct braking point, and traction-optimized acceleration, can help the driver constantly improve their skills. 2. Bringing the future to life: first virtual drive in the BMW Vision iNEXT. The portion of the day experienced in mixed reality illustrates many aspects of the BMW Vision iNEXT and provides an exciting glimpse of the mobility of the future. The aim of the future scenario, experienced with all the senses, is to show visitors what it feels like to be on the road in the BMW Vision iNEXT: The day is planned to perfection and driving time is used efficiently – whether for work, errands, relaxation, or for interacting with friends. The focus here is on seamless integration of the vehicle into the customer’s digital life. The possibilities offered by the vehicle and the BMW Intelligent Personal Assistant enable a smooth-running mobility experience, completely stress-free and proactively adapted to each situation. As the driver takes a seat, their digital world seamlessly connects to the vehicle and the journey begins. Initially, the human driver takes control of the vehicle (in "Boost” mode). The windshield becomes an augmented-reality screen with information about the drive and surroundings. As soon as the vehicle reaches the highway, the BMW Intelligent Personal Assistant suggests that the vehicle take over driving from here and the journey continues autonomously. The steering wheel and pedals disappear, creating an open and spacious feeling. A video conference is scheduled for shortly after and to set up the interior, the BMW Intelligent Personal Assistant suggests switching to "Executive” mode, which transforms the cockpit into a mobile office. The windshield becomes the screen showing the people participating in the videoconference, while shared documents can be viewed at the same time on the Control Display. Once the videoconference is finished, another task that can be taken care of on the go is displayed. For this, the driver’s preferred, fully integrated shopping application is opened. Within the app, the personal assistant guides the driver and assists them throughout the buying process. The purchased item will be delivered punctually by drone directly to the vehicle’s destination: home. A short time later, the vehicle receives a real-time signal from the front door of the driver’s smart home. Friends have rung the doorbell and are waiting to be let in. The video camera mounted on the front door relays the image directly into the vehicle, and, via an integrated remote function, the driver is able to open the door. On the final leg of the journey, the driver is told that the friends at home have already tuned in to the pre-game coverage of the football game they arranged to watch on TV. The driver starts streaming the show on the vehicle’s windshield, arrives home in time for kick-off, and they are all able to enjoy the game together. 3. The future of driving pleasure: the BMW Vision iNEXT. The BMW Vision iNEXT symbolizes the dawn of a new age of driving pleasure. Highly automated, emission-free, and fully connected, it brings together all the BMW Group’s strategic innovation areas. With recent developments in autonomous driving and increasing connectivity, the BMW Vision iNEXT creates totally new experiences and possibilities for making the most of driving time. All these possibilities center more than ever on human wants and emotions. The interior of the BMW Vision iNEXT creates a mobile environment designed to enhance quality of life: a new "Favorite Space" where driver and passengers alike can relax and choose what they want to do. The BMW Intelligent Personal Assistant is a constant companion and expert. 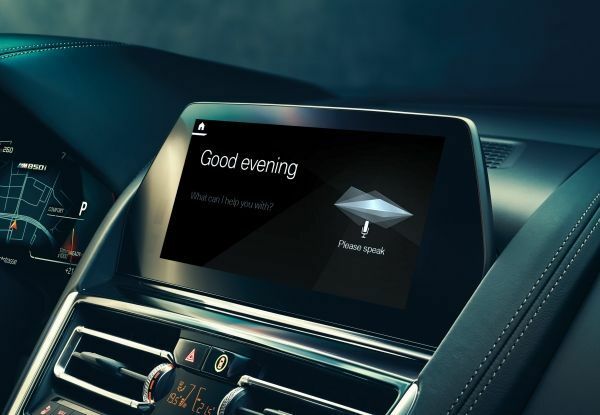 With its typical BMW character, it is always fully connected and serves as an intuitive interface to the digital environment using natural language interaction. With the size and proportions of a modern BMW Sports Activity Vehicle (SAV), the BMW Vision iNEXT cuts an authoritative figure. The vehicle instantly conveys its trailblazing character through clearly sculpted forms and surfaces. Two large opposing doors, with no B-pillar between them, make it easy to climb inside. A further characteristic is the unusually distinct separation between cockpit and the rear. A spacious continuous seat area gives the rear a laid-back lounge character. Inside the generously-sized cockpit, the driver’s area is defined by only two visible digital display panels and the steering wheel. The flat dashboard with beige fabric covering teams with wood accents and a clearly patterned wooden floor to create an inviting atmosphere. In “Boost” mode, the steering wheel and displays are angled clearly towards the driver. When switched to “Ease” mode, the driver’s immediate environment changes: The steering wheel retracts and the pedals drop down to create a more open sense of space. The display panels switch from driving-related content to “Exploration” mode, which provides the driver and passengers with suggestions for places and events in the surrounding area that could be of interest to them. “Shy Tech”: Innovative technology integrated out of sight, but always available. Apart from the steering wheel and displays in the driver’s area, there are no other screens or controls to be seen in the BMW Vision iNEXT. To preserve the cozy, inviting character of the rear compartment, all technology is kept out of sight and only becomes visible and operable when needed. For example, in the future it may be possible to operate various functions via surfaces made out of wood or fabric. Dynamic projections can turn any surface into an interactive display. The BMW Vision iNEXT highlights three different visionary applications of this “Shy Tech”: the BMW Intelligent Personal Assistant, Intelligent Materials, and Intelligent Beam. Intelligent Materials enable operating controls to be integrated discreetly into interior surfaces. When driving in “Boost” mode, the Control Display can be operated using conventional touch functionality. However, in “Ease” mode, the center console’s wooden surface assumes this control function instead. Arm and hand posture is just as relaxed as when using the iDrive Controller: The hand simply lies on the perforated wooden surface and, whenever inputs are made, points of light follow the finger. The Jacquard cloth in the rear also possesses integral control functionality. For example, music playback can be controlled using various gestures that are visually emphasized by LEDs that light up underneath the material. In the use of media, as with vehicle operation, the digital and analogue worlds will merge more and more. It is increasingly possible to visualize information in projected form, which means displays may no longer be needed in the long term. The Intelligent Beam technology showcased in the BMW Vision iNEXT is already a step in this direction, since it can serve as both a dynamic reading light and an interactive projection screen. This enables the text in a printed book, for instance, to be supplemented by images, moving content, and interactive graphics – all of which can be controlled by touch. 4.1 The BMW Intelligent Personal Assistant – today and in the future. The BMW Intelligent Personal Assistant digital character is finding its way into current BMW models. This marks the beginning of a new era, in which vehicle operation and access to functions and information will increasingly be performed simply by voice control. The BMW Intelligent Personal Assistant can be activated by voice command (“Hey BMW”). Unlike other digital assistants, it can also be given an individual name (such as “Charlie” or “Joy”). With the BMW Intelligent Personal Assistant, there is always a genuine BMW expert on board, who is familiar with and able to explain vehicle functions. It also serves as a digital passenger, who helps the driver find a parking space or use office functions in the car. With the relevant options, the BMW Intelligent Personal Assistant also pays attention to the driver’s wellbeing. In response to a spoken command, for instance, it can activate an interior experience, such as the Vitalize or Relax program, with a combination of interior lighting, air conditioning, fragrance, seat massage, shading, and seat heating or ventilation. In its future form, the digital companion will be even more intelligent, forward-looking, and better connected: It will bridge the gap between the vehicle, its extensive functions, and people’s digital lives. The BMW Intelligent Personal Assistant manages mobility needs, organizes the day, and performs complex tasks that extend beyond the vehicle. As an intelligent digital guide for mobile life, it plans the daily schedule, manages personal calendars and to-do lists, makes suggestions, and handles a variety of digital services. 4.2 Digital services for electric-vehicle charging. BMW Digital Charging Service and BMW ChargeForward: intelligent charging – to support the energy transition and lower costs. With BMW ConnectedDrive networking technology as standard and the BMW Connected app, BMW, MINI, and BMW i electric and plug-in hybrid models are perfectly suited for digital services that intelligently manage charging of their high-voltage batteries. The BMW Digital Charging Service offers customers the option of charging their vehicle at the most favorable hours, depending on individual electricity tariffs and their planned departure times. BMW ChargeForward takes things a step further. Over 300 drivers of BMW i cars in the San Francisco Bay Area in the state of California are participating in this pilot project. BMW receives a projection of hourly renewable energy generation from the local utility (Pacific Gas and Electric) and uses this information to align charging with times when renewable energy is most available on the grid. Participants receive a financial incentive for doing so, reflecting the fact that charging at times of high renewable generation will be most cost-efficient to the grid in the long-term. Not only do participants drive very inexpensively and locally emission-free – they are also able to use CO2-neutral electricity for a much higher percentage of their travel. In addition, with a digitally managed, flexible charging strategy, BMW can send signals to interrupt the charging process whenever general demand for electricity is particularly high, thereby relieving the burden on the public electric grid while still meeting drivers charging needs. Going forward, high-voltage batteries from electrified BMW and MINI automobiles will not only use renewable electricity to the maximum extent, they will also feed energy back into the grid whenever there is a shortage of energy from renewable sources. As a buffer for "green" electricity, these vehicles not only support the clean energy transition, but also become part of an intelligent network that is instrumental in stabilizing the electricity grid.